I remember the days when I used to scour listings of used gear looking for that “world class” component being sold for a song. I sought something that was respected and well known enough that if it didn’t suit my taste I could resell it for a break even demo. The upshot was that I could conceivably find a fantastic product which would propel my system forward in sound quality. I tried dozens of components in the search for ones which would thrill me, many of which I had only scant familiarity. I know the feeling of the anxious purchaser, worried that the seemingly monstrous outlay of money will not bring a better rig to fruition, or worse bring a problem in the form of a damaged delivery. Frankly, half the time it didn’t work out well and I ended up selling the component within a year or so. It was hard to accept upon first hearing that I’d made a mistake. If the magic didn’t happen and I began to make excuses such as, “It’s not burned in,” it would amount to little more than stalling; months later it would be cycled out of my system. I resolved to formulate stringent criteria by which I could hone my selections to find worthy gear and reduce the misses, ideally to zero. Using such criteria I was able to secure enjoyable gear even though I had not pre-qualified it with a listening demo. It may come as a surprise to some that the amplifiers I write about here, a pair of Wells Audio Innamorata, a more utilitarian offering with RCA inputs only, a single set of outputs, and no capacity to switch to mono mode, I had not tried in my room. I had heard the Innamorata individually in show systems, and had compared the Akasha to a single Innamorata in my system. It wasn’t as though I was purchasing blindly. But it was a bit risky shelling out for two units not having heard the result. Why would I make such a decision? I did know the result, insofar as my experience with pairing stereo amps and running them in vertical passive biamping has taught me fairly well what to expect. I cannot think of a single instance where in use of a stereo amp I was disappointed when utilizing two of them in a passive biamp configuration. Once I knew the character of a single Innamorata it was not difficult to envision the performance of using two of them. It might be ideal to have the functionality of a Stereo/Mono mode for the Wells amps, but this feature is not available. I will start my description of this amp used singly. The Innamorata is essentially an Akasha amplifier with some Bybee Technologies devices installed. You will get a feel for the Akasha and my euphoric experience with it in my Akasha Review. This article will build upon the explanation and experience of the Akasha, highlighting the differences. First, a disclaimer; this is neither a review, nor an endorsement independently, of Bybee products. In this article I am not interested in making a definitive statement regarding these devices although I may do so at a later date. There are enthusiasts and detractors of Bybee products, but, again, my purpose here is neither to debunk them nor endorse them. I realize they are somewhat controversial, which I had a vague awareness of when purchasing this amp. If the Innamorata did not sound significantly better than the Akasha I would have bought two of the Akasha instead. 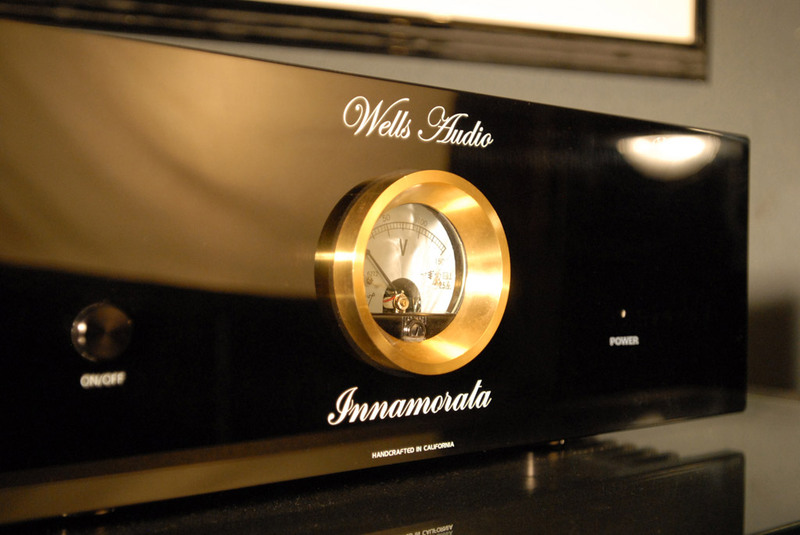 Jeff Wells, the owner of Wells Audio and proprietor of the Audible Arts store in Campbell, California, told me the platform for the Innamorata is exactly the same as for the Akasha. However, it clearly holds independent toroid transformers for each channel versus a single toroid for the Akasha. (Jeff Wells informed us that the current Akasha will now also feature two transformers, like the Innamorata. -Pub.) Beyond that, the Bybee products excepted, the amps do appear to the eye as identical. The Bybee products are not much additional componentry for $2K; two jumbo postage stamp-sized circuit board boards affixed to the L/R rails and a pair of silver tube-like “Bullets,” which look like crude CO2 cartridges, anchored to the bottom of the chassis. I read one criticism of these devices which asserted they are comprised of nothing more than a resistor packed in dirt. If it is true it would be disgusting to think I paid a premium for such a pittance of parts. I did an informal check with one industry insider who sells Bybee products, and who on condition of anonymity admitted that they are not a sure thing. In certain applications they are purportedly terrific, while in others somewhat uninspiring. The gist of their perspective was that it depends on the designer and how the Bybees are utilized. The ideal ones must be chosen by the designer, not a one-size-fits-all scenario. I am confident enough in the insider’s opinion that I felt confident enough to not eliminate the amp simply because of the presence of the Bybee elements. When exploring the amp for the presence of the postage stamp Bybees I noticed a large bolt threaded through it securing a black cover, while the other is al fresco. It appears not to be a build quality issue as both amps are identical in this regard. The cloak and dagger nature of hiding parts sometimes seems a bit comical, considering that anyone can open the amp and dig around in it. Chris Owen of Clarity Cable paid a visit and was intrigued by the topology of the Innamorata. He surmised that it might be a variant of the new crop of N-core amps. Note that this was conjecture on his part based on shining a flashlight through the narrow slits of the top grill. I did not allow him to open up the amp, though I have a feeling he would have loved to! He had no reservations about the sound of the amp, being fully impressed by its capabilities. If you doubt me, feel free to ask him. One operational anomaly presented itself, that being a fraction of a second difference in the timing of the clicks emitted during startup of the two amps. One amp emits a “ClickClick,” while the second emits a, “Click, Click,” with a noticeable separation between them. These are the kinds of things that can drive an audiophile wild with speculation. The mind reels with possibilities, “Are the components internally really the same? Is there some sort of malfunction happening in the one unit, and if so, which one? Does this presage the demise of one amp?” Thankfully, over time I have learned to accept certain split-second dissimilarities between components to the point that if I cannot hear a sonic degradation or distinction I will let it go. Is that unwise in this instance? If the amp breaks in a year the answer is yes, but if it is still running perfectly in ten years the answer is no. Sonically I can’t tell the difference between them and probably, neither could you. So, I am shelving that observation indefinitely, assuming there is a fine variable in the timing of startup of such amps. Some companies go to maniacal lengths to ensure everything the eye sees or the hand touches is perfectly pleasing. That is not a bad thing, but it does not ensure that the product will avoid being uninviting or even boring sonically. Here is an amp which is energetic, inviting and anything but boring. In defense of my purported foolishness to buy something so categorically uncertain, I have heard a lot of amps both in my room and at shows, yet the Innamorata is special, very enchanting sounding. At a price of $6K it has sound that amps at multiples – even up to five times – struggle to attain, resistor in dirt or not. It also is clearly superior to the Akasha in every respect sonically save one, the Akasha having a feather’s touch more definition. In concluding this brief look at the innards of the amp, let me reinforce I am not a voodoo audio system kind of guy who chases down tweaks to the point of absurdity. I expect hard benefits sonically from proffered components and methods. I ended up with these amps for one reason; they have good enough parts and build quality at the price point while offering close to cost-no-object sound quality. When it comes to selection of components I have often said that I will not give up definition. However, when all other aspects of performance are surprisingly enhanced and the definition is only marginally diminished I usually will opt for the ‘everything else” choice. In this case, the Innamorata is superior in terms of everything else as compared to the Akasha. What do I mean precisely? The soundstage is widened, made more seamless, and filled with more palpable imagery. There is a more uniform portrayal of the L/C/R soundstage with both more distinction between the three sonic vectors and simultaneously more fluidity between them. Tonally, the Innamorata is even more convincing than the Akasha. It is tonally more “deep” in the way that one hue of color appears more rich or deep than another. The Akasha is not a flat, “washed out,” sounding amp, but compared to the Innamorata it might be perceived as being slightly so. Instruments are fatter sounding, strings thicker and more reverberant, skins of drums and reeds of woodwinds more tactile in nature. There is an additional differentiation, but I believe it should be considered a subjectively weighted attribute versus a clear advantage, and it pertains to the depth of the soundstage. The Akasha sets the performers back noticeably compared to the Innamorata. I have encountered this “up close” soundstage before when I have used products with passive devices in them, such as cables with passive networks. Over time I came to dislike it as it was, seemingly, inherently subtractive of the definition to a degree I would not accept. The QOL Signal Completion Stage behaved similarly in my system. While it expanded the soundstage and added air, it also lessened definition quite significantly in comparison to a system without it, which is why it failed my Law of Efficacy. Contrary to these other experiences, the diminishment of detail when the Bybee devices were added to the amp was nearly at the vanishing point. The variance was so subtle that I played portions of tracks over and over in an effort to ascertain precisely how the Innamorata was lessening the detail. I concluded that if I had to work so hard to isolate the effect I would not be bothered by it if the two amps were not being actively compared. In other words, when it came to the principle of achieving maximum definition, the Innamorata did not fail my Law of Efficacy, as it provided enough detail to be nearly indistinguishable from the Akasha even though it had passive devices added to the signal path. With the issue of definition settled, at first I was unsure whether I liked how the Innamorata drew up closer the locus of the soundstage, but I was convinced I could both adjust it and become adjusted to it. I could use preamp, cabling, source, speaker placement, etc. to influence the soundstage depth, and over time I would slowly lose the short term memory of the comparison. I was correct; within a week I was very happy I did not dismiss the Innamorata over that aspect of performance. Now I feel very comfortable with the more intimate, immediate soundstage of the Innamorata. Jeff had said of my choice of acquiring the pair of Innamorata, “You will not regret it,” and he was right. My first run with the amps paired them with the Legacy Audio Whisper DSW “Clarity Edition.” I have had a lot of amps on the Whispers in the past two years. These speakers have attained performance gains again and again as they and the components feeding them have been upgraded. There were two things in the past six months which catapulted the Whisper into an entirely different class of sound from my previous experiences. One was the “Clarity Edition” upgrade, which at my request all drivers in the speaker were fed 10Ga. Clarity cabling. Also included as part of this upgrade Bill Dudleston switched the capacitors to Clarity Caps’ MR range (not affiliated with Clarity Cables), and outfitted the speaker with the new Legacy Air Motion Tweeter system. No analogue sources? I am skeptical. thank you for your well-written review of the Inamorata. As I noted that you also have or had the Ulysses speakers in your home which you reviewed in the past, may I ask whether you also had a chance to try the Inamorata or its brother Akasha on the Ulysses or otherwise think this could be a good fit? Any advice is very much appreciated. My apologies for a tardy reply. Yes, I have had occasion to try the Innamorata with the Ulysses speakers, and in brief the speakers have never sounded better! There is a good synergy between the Innamorata and the Daedalus speakers. I would not hesitate to recommend this amp for them. I have a set of Sunny H3 W12 speakers that I have been trying amps/integrates with. Next on my list was the Norma IP140 integrate, but this Wells amp sounds inviting!